When I first saw the Inov-8 TrailRoc line at Outdoor Retailer last summer, I thought the concept was fantastic: Take a trail shoe platform and offer it in an array of cushions and drops to suit a variety of needs. If you are new to the whole minimalist thing and want to ease your way in, you can start at the top and work your way down. 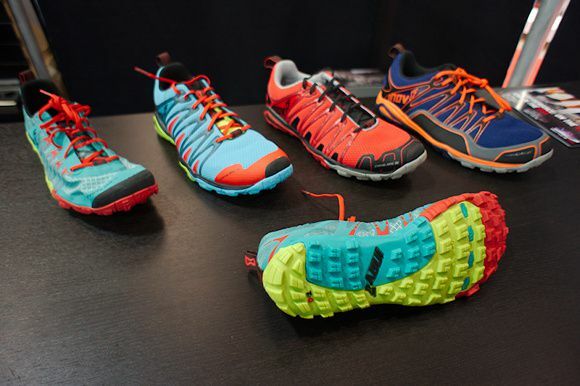 The entire TrailRoc line from most minimal on the left to most cushioned on the right. The Inov-8 TrailRoc 150 is the end-of-the-line in the TrailRoc series. If you start at the TrailRoc 255, you get 6mm of heel-to-toe drop, and 6mm of cushioning (which means a total of 12mm at the heel). Moving down to the TrailRoc 245 means you get 6mm of cushioning and 3mm of drop (for at total of 9mm at the heel). Next is the TrailRoc 235 which gives you 6mm of cushioning straight-across (no heel rise). What the TrailRoc 150 brings - or more accurately doesn't bring - to the table is no midsole cushioning whatsoever. For women, the model numbers are slightly different: the 246, 236, and the 226. There is no women's specific version of the 150 - it is considered a unisex shoe. Note: For those of you unfamiliar with Inov-8 naming conventions, the model number of their shoes also indicate their approximate weight in grams. The TrailRoc 150 is one of Inov-8's most minimal trail shoes to date - the other being the Bare-Grip 200. In fact, the 150 is arguably one of the most minimal off-road shoes on the market right now. I say arguably because once you start getting this minimal, comparisons start to become an exercise in splitting hairs. Earlier this year I did a "hair splitting" review of the TrailRoc 235 and the VIVOBAREFOOT Breatho Trail. I rated them as being roughly equivalent in their minimalism, but docked the 235 slightly for it's narrower toebox. At the time of that review, the TrailRoc 150 wasn't yet available for testing. If you haven't read that review yet, you might want to start there as I am going to be spending some time in this review comparing the 150 to the 235. The TrailRoc 150 features the same outsole and anatomic last as the 235, it shares a similar aesthetic/styling, but the uppers are quite different. While the 235 has a multi-layered mesh, the 150 has a single layer of tightly woven nylon fabric (reminiscent of a lightweight cordura), reinforced with laminations of light nylon ripstop. While the upper is thin and light, it is not stretchy like that of a mesh. Abrasion resistance. I have found that the closer to the ground a trail shoe is (i.e. no midsole), the more susceptible it is to abrasion. Having good abrasion resistance close to the ground is essential for a minimalist trail shoe. The fabric upper of the 150 appears to be more abrasion resistant than that of the mesh found on the 235. Resists debris. Another downside of low-to-the-ground trail shoes with an open mesh is that dirt and debris can more easily migrate through the fabric. The tightly woven fabric used on the 150 helps prevents this problem. Less breathability. The uppers don't breath quite as well; these are not as airy as the 235 so my feet run a little hotter. Less drainage. When these shoes get soaked, my feet feel like they are sloshing around for longer than a more open mesh. The water eventually does come out, just not as quickly as the 235. There is, however, only a single layer of fabric to absorb water, and thus they still seem to dry out fairly quick. While the insole could be removed from the 235, the stitching underneath indicates that they were not really intended to be worn this way. On the 150, it is clear that these were designed to be used both with and without the 3mm insole. The footbed is finished in such a way that there is no exposed stitching. Something I find particularly interesting about the fit of the 150 is that the toebox feels a bit roomier than the 235 for the same size of shoe. I actually prefer the fit of the 150 over the 235, especially with the insole removed. That being said, the toebox could still use a little more room. One thing to note is that because the uppers do not stretch, I have to lace these a little looser to allow for foot expansion. In theory, these shoes could be a good candidate for an elasticized lace, as it would allow for more give/stretch in the uppers. One feature I really like about the 150 is the rubber toe bumper. On the 235, the toe bumper is a thin plastic coating that - on my test pair - has had some adhesion problems. On the 150, the rubber layer is more substantial, is well bonded, and seems to protect the toes quite well. Often, on Invo-8s lighter shoes - including other models in the TrailRoc line - they use TPU (Thermoplastic Polyurethane, a fused flexible plastic) overlays for reinforcement. On the 150, they have forgone the TPU and instead laminated a ripstop fabric over top of the base fabric. While this looks good on the outset, it doesn't take long for the overlay to start wearing. Abrasion wears against the edges and quickly starts to fray the fabric. If those overlays offer any structural integrity, then this isn't a good design. If the overlays are just cosmetic, the pretty face doesn't last long. At this point it is difficult for me to say whether the structure is being compromised, only time will tell. Abrasion causes fraying along the edges of the fabric overlays. The TrailRoc sole is said to be designed for both hard pack and loose conditions. In theory you can even run on roads with these (perhaps en-route to the trail). Because the sole of the 150 is so thin, you can feel the lugs through the sole, especially if you remove the insole. This isn't such a big deal when off-road, as you can feel everything through the sole. If you have to cover a substantial amount of miles on hard pack or pavement, and feeling little nubs under your feet is something you are not fond of, then I would suggest sticking with the 235. Personally, I absolutely love the thin soles, extreme flexibility and ground feel that this shoe offers. There are shoes out there that have as good (or even better) ground feel, but lack an agressive off-road tread. There are others that have a better toebox, good grip, but less ground feel. If you are looking for a shoe that combines the best ground feel with the most agressive outsole, the Inov-8 TrailRoc 150 is currently where it is at.